Microsoft Corp. announced the launch of the latest version of the world’s most-used browser with the release of Windows Internet Explorer 9 in 39 languages at an event at the SXSW Interactive conference. Internet Explorer 9 is Microsoft’s most-downloaded browser beta of all time, with more than 40 million downloads, and it has already has gained more than 2 percent usage on Windows 7. Already more than 250 top sites from around the globe are taking advantage of the capabilities in Internet Explorer 9 to deliver differentiated experiences to their customers, with many featured on http://www.BeautyoftheWeb.com. Together, these partners reach more than 1 billion active Internet users on the Web. • In social and information networking, Internet Explorer 9 partners include category leaders such as Facebook, Twitter and WordPress — the No. 1 global blogging platform — in addition to leading professional networks in the U.S., Europe, Russia, Korea and Latin America. • In e-commerce, partners include not only the leading worldwide shopping site, Amazon, and the No. 1 worldwide auction site, eBay, but also the leading site in the emergent “daily deals” space, Groupon. • Video and streaming partners include three of the top five video-on-demand sites in the U.S. — Hulu, Break.com and Dailymotion — and leading Internet radio sites Slacker, Pandora internet radio and Jango. In addition, partners include top global broadcasters CBC and CTV in Canada, Wat.tv in France, and CNN in the U.S.
• News website partners in the U.S. include the Wall Street Journal, USA Today and The Huffington Post, as well as dozens of leading news sites globally across all major geographies. 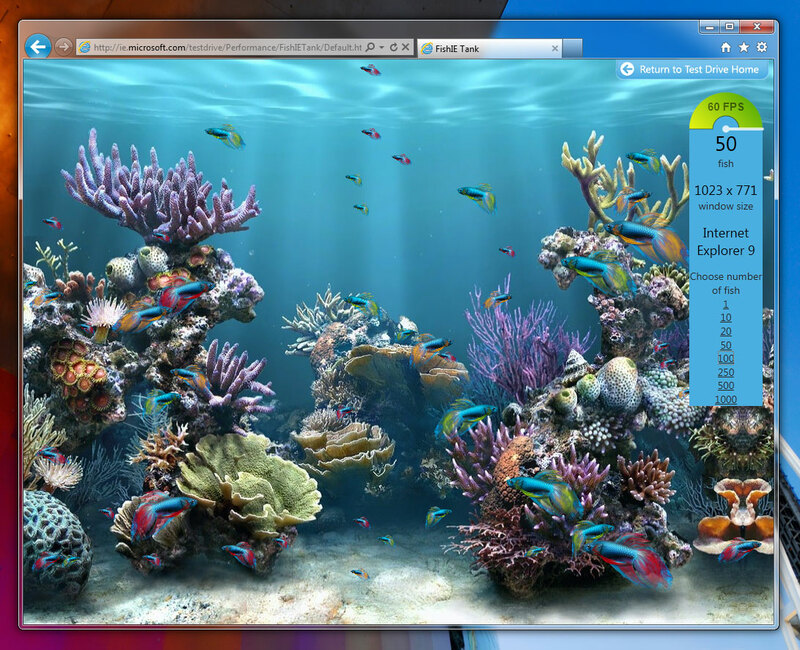 Internet Explorer 9 FishIE Tank demo illustrating full hardware acceleration, allowing text and graphics on the Web to take advantage of the entire PC via the GPU.